by Donald Streeter. Softbound, 144 pages, 8" x 11". An eagerly awaited reprint by a recognized professional smith. 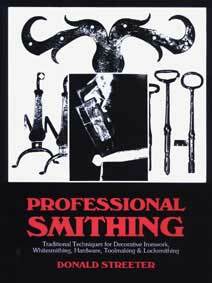 Here traditional smithing techniques are presented in clear, step-by-step text and photographs, enabling the reader to produce high quality,hand forged ironwork. 257 illustrations and detailed descriptions of workspace layout, specialized tools and techniques, whitesmithing, toolmaking and locksmithing. Special emphasis on hand forged kitchen utensils, fireplace tools, locks & keys, hinges, hasps, latches, springs & more.